How do you market a 422 horsepower, 23 mpg muscle car in an era of $4-a-gallon gasoline? By touting the fuel economy. 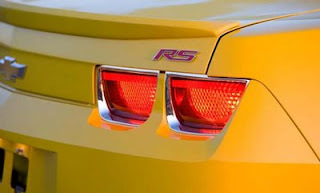 "We'll be promoting the fuel economy story very much," Ed Peper, Chevrolet's vice president, told reporters last week, showing off the 2010 Chevrolet Camaro. "We are two or three mpg ahead of the competition." 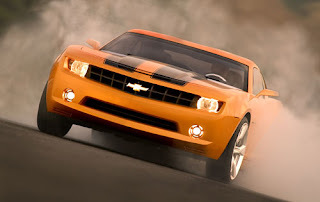 The rear-drive Camaro goes into production in February in Oshawa, Ontario. General Motors views the competition as the Ford Mustang, Nissan 350Z, and Dodge Challenger, said Cheryl Pilcher, the Camaro's product manager. Peper said the 304 horsepower V-6 version will get an estimated 26 mpg, and the 422 horsepower V-8 version will get an estimated 23 mpg. "And we are still working on it," he said. He hinted that a turbo four-cylinder version is in the works. The volume? "We will build as many as we can sell," Pilcher said. www.5thgen.org has the information you need! Tune in to see the official release of the production version as well as pricing information and other details! Well, they will be announced by Chevrolet Tuesday, July 21, 2008. We are working with 5thgen.org to bring you the official information the second it is released to the public! Stay tuned to 5thgen.org for this information right from GM! I saw this posted on www.5thgen.org this week, there are some nice renderings by Greg Russell on the web. I can't wait for this car to hit showrooms and race shops all across the country! Kids 15 and under can color their version of a 5th Gen Camaro for a chance to win a die cast car! Brought to you buy www.5thgen.org and Newman Chevrolet in Cedarburg, Wisconsin, click the image below for a full size PDF file you can color. Top votes at MIDNIGHT 8/23/08 WINS! Be sure to include, NAME - AGE - and ADDRESS, in case you win!